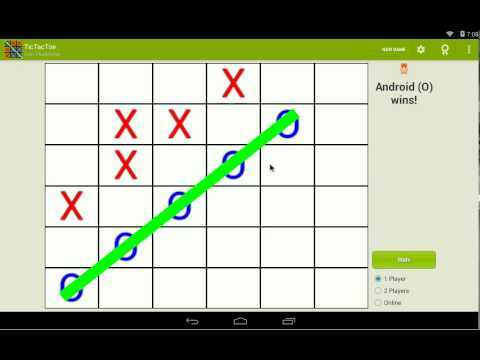 Game of Tic Tac Toe with single (against AI), multiplayer and online game modes. * Ability to switch between single and multiplayer player game modes. * On boards bigger than 3x3, player should put 5 marks in a horizontal, vertical, or diagonal row to win the game. Also known as "Gomoku" or "5 in a row" game. Tic-tac-toe is a game for two players, X and O, who take turns marking the spaces in a 3×3 grid. The player who succeeds in placing three respective marks in a horizontal, vertical, or diagonal row wins the game. If the grid is full and there is no winner, the game ends in a draw.